Happy Wednesday! Have you had a chance to check out my new program yet? It’s a 10 week program all about Self Care. If you haven’t checked it out yet, you can head here to watch a little video & sign up to see all the details. Now, some of you may be wondering what “self-care” really means and looks like, so I want to take a few minutes right now to help you imagine what supreme self-care would look like in your daily life. This is what life will look like once you’re a master at self-care. Imagine… that you have so much respect and reverence for your body that you actually, genuinely love “movement”. Exercise never, ever feels like a chore again. Imagine… that when difficult emotions start to bubble up inside of you, you’re like “okay, I can handle this”. You know how to feel, embrace, and process all of your feelings with grace. You start to “mother” yourself through your feelings. Imagine… your happiness not being dependent on how successful you are at work, if the guy texts you back, or the number on the scale. You are divinely connected to your own sense of self worth and you have access to true happiness in any moment, regardless of your circumstances. Imagine…when sitting down to eat at a restaurant, you know the exact food to pick that both nourishes your body AND your soul. Food finally feels EASY. Imagine…upping your standards for yourself big time. Because you’re embodying what it means to love yourself, you don’t accept anything that doesn’t reflect that self love. You raise your standards for relationships, the food you put in your body, the commitments you’re willing to make, how you exercise, etc. Imagine…knowing yourself so well that you have clarity when it comes to making decisions. When an opportunity comes up, you know if you should say yes or no. Imagine…when your inner critic comes out to play (i.e. the perfectionist, overachiever, harsh critic), you know how to “tame” this part of you in a productive way, understanding why that voice is there, but not BELIEVING in it. This allows you to access your truth instead of being taken down by your inner critic. Imagine…being able to speak up at a big work meeting or on a date without letting your fears of “saying the wrong thing” or “what will people think?” stand in your way. Imagine…allowing yourself to connect deeply and vulnerably with others because you know that you’re worthy, whole, and there’s never anything wrong with you. Imagine… letting your friends and family “off the hook”. They don’t need to do everything right anymore to make you happy. 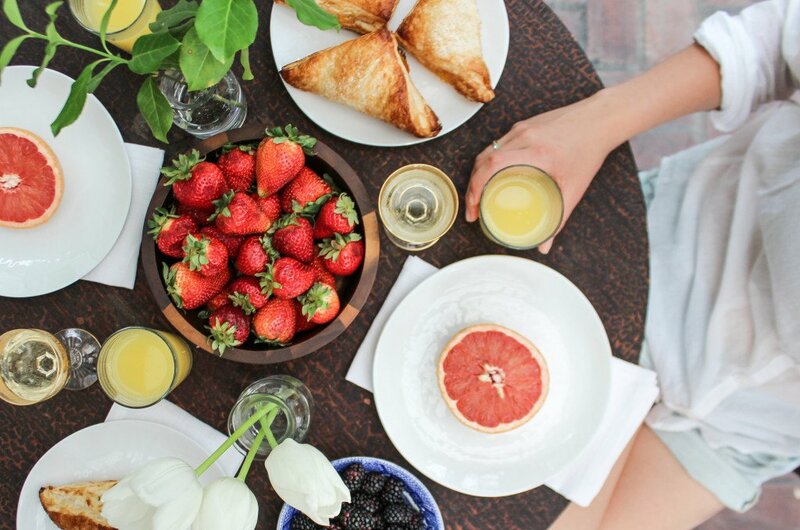 Because you’re taking such good care of yourself, everything else is just icing on the cake. Imagine… never feeling alone because you have such a strong sense of self. Imagine… when you get dressed in the morning, you only put on comfortable, beautiful clothes that make you feel self expressed and that honor your physical body. Imagine…creating a schedule and calendar that reflects your core values and that helps you feel relaxed, organized, and in control of your life. Imagine… when you wake up in the morning, you have a routine of 4 or 5 things you do that help you feel inspired and loved. When you look at your phone, you only see things that encourage the woman you want to be. Phew! I could go on and on, but I’ll stop there for now. How does that feel? Pretty amazing right? I want you to know that this is how you deserve to be living. This is true self-care, and while we usually aren’t taught these things growing up, I’m turning that around. If you want to learn the steps to create this lifestyle for yourself, please check out my new program. 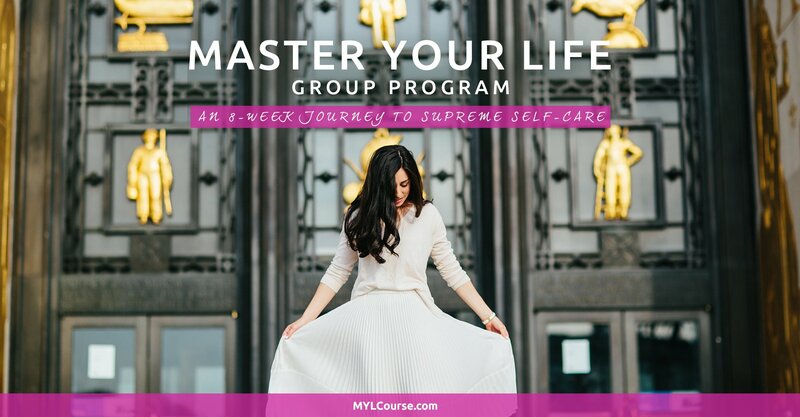 Master Your Life: A 10 Week Journey To Supreme Self-Care. I’m throwing in a bonus because I love encouraging people to dive right in (it’s very empowering to just commit). If you sign up before Friday 9/18 at noon, you’ll get a 60 minute one-on-one self-care deep dive with me. You can use this private call at any point between now and when the program ends (Christmas). 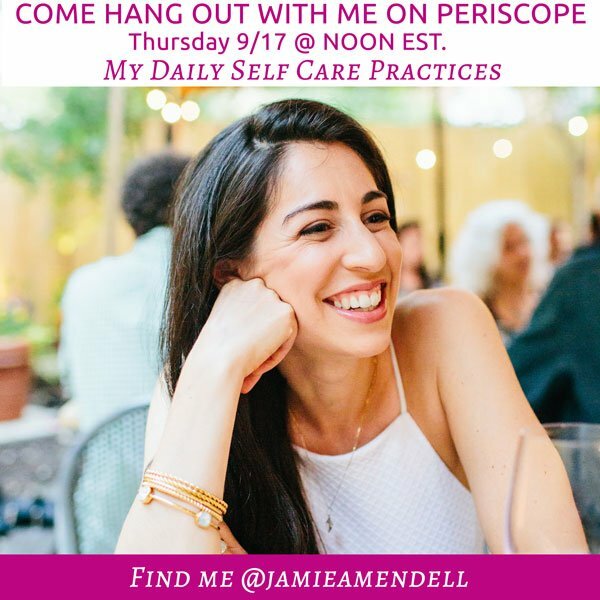 And… I am also going to be going over my personal Self-Care Practices on Periscope tomorrow (Thursday) at 12:00pm EST. Bring along your lunch and let’s chat Self-Care and what that looks like in everyday life! If you don’t have Periscope yet, it’s really easy to get. Just download the app on your phone, search for me @jamieamendell and click follow. Then you’ll be notified when I am live. P.S. Here’s the link for the Master Your Life Program once again! Remember, if you enroll before Friday 9/18 at noon, you get a free 60 min one-on-one call with me to use at any time during the program. Hey Jamie – Are you still going to run the free 60 minute talk promo for 2018? If so, can you update the dates? I am really glad a friend shared your work with me. Just when I need this in my life!